The objective is to emulate what is achieved with a Spectrum Analyser with Tracking Generator, or Sweep Generator with logging power meter. 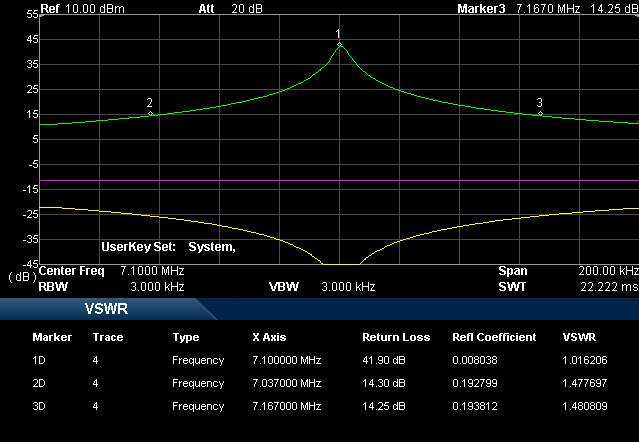 Above is a Return Loss scan of the antenna using a Spectrum Analyser with Tracking Generator and RLB. Essentially, this is the measurement to replicate with the simpler ham shack equipment. Above is a block diagram of the test configuration. The PC controls the IC-7410 using the built in USB CIV port. 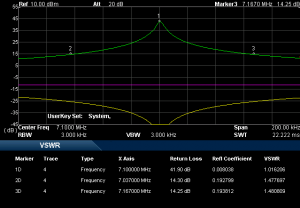 The RF output of the IC-7410 is attenuated to a level safe for the RLB. The the antenna system is connected to the DUT port of the RLB, and the other port connected to the RFPM1 power meter. The RFPM1’s USB data logger is connected back to the PC to allow automated recording of the power level. The test is controlled by a script on the PC. set /p meas="Measure %freq%: "
set /p meas="Stop HID input then ENTER to quit:"
Above is an example Windows bat file to orchestrate the measurement. The script sends configuration commands to the transmitter, and waits for the measurement result and writes it to a log file. RIGCTLP="$RIGCTL -m $MODEL -r $PORT -s $SPEED"
Above is an example *nix Bash script to orchestrate the measurement. The script sends configuration commands to the transmitter, and waits for the measurement result and writes it to a log file. 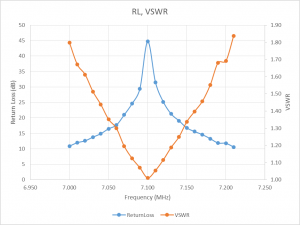 calculation and reporting of the difference between 1 and 2, RL, and from that, VSWR. 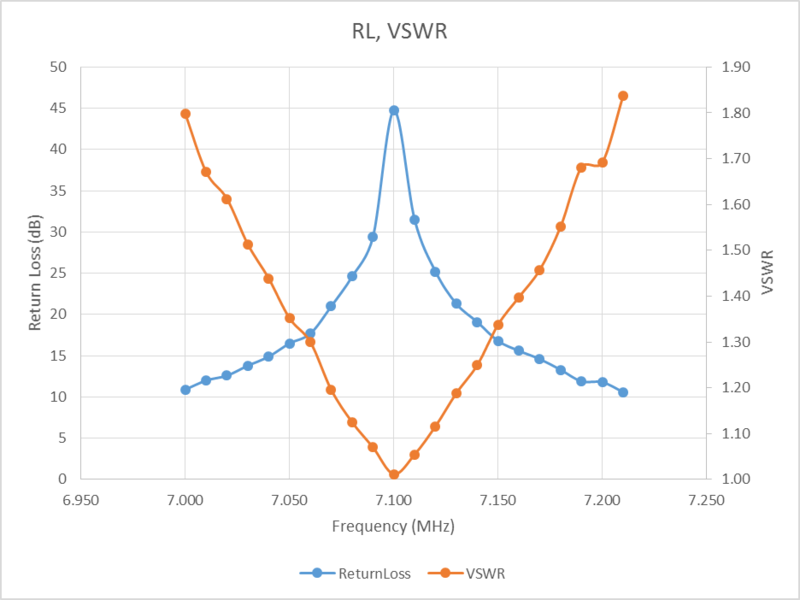 Above is a plot of the calculated Return Loss and VSWR. There are a couple of bumps in the graph which could be reduced by averaging several readings (say 10) in the script file, an exercise for the reader. An automated Return Loss sweep using a CIV controlled transmitter, suitable power attenuator, and the RFPM1 with data logger is quite feasible.